A film noir gangster story set in 1949 New Orleans. Under The Gun: A film noir gangster story set in 1949 New Orleans. The Micks robs the Spades, but the Wops make out with the loot and the reefers. Paddy Johnson has had enough, andhe saves his girl and nabs his piece of the rackets pie, but not before Mobley and his cohorts from Darktown get the war on! 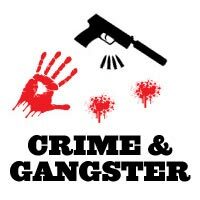 Crime and Gangster Films are developed around the sinister actions of criminals or gangsters, particularly bankrobbers, underworld figures, or ruthless hoodlums who operate outside the law, stealing and violently murdering their way through life. In the 1940s, a new type of crime thriller emerged, more dark and cynical – see the section on film-noir for further examples of crime films. Criminal and gangster films are often categorized as post-war film noir or detective-mystery films – because of underlying similarities between these cinematic forms. Crime films encompass or cross over many levels, and may include at least these different types of films: the gangster film, the detective (or who-dun-it) film, the crime comedy, the suspense-thriller, and the police (procedural) film. Film gangsters are usually materialistic, street-smart, immoral, meglo-maniacal, and self-destructive. Rivalry with other criminals in gangster warfare is often a significant plot characteristic. Crime plots also include questions such as how the criminal will be apprehended by police, private eyes, special agents or lawful authorities, or mysteries such as who stole the valued object. They rise to power with a tough cruel facade while showing an ambitious desire for success and recognition, but underneath they can express sensitivity and gentleness. Gangster films are often morality tales: Horatio Alger or ‘pursuit of the American Dream’ success stories turned upside down in which criminals live in an inverted dream world of success and wealth. Often from poor immigrant families, gangster characters often fall prey to crime in the pursuit of wealth, status, and material possessions (clothes and cars), because all other “normal” avenues to the top are unavailable to them. Although they are doomed to failure and inevitable death (usually violent), criminals are sometimes portrayed as the victims of circumstance, because the stories are told from their point of view.